The largest state in the Peninsular of Malaysia, Pahang is rich with diversified tourist attractions with plentiful of accommodation. Pahang is no stranger when it comes to greeting visitors, so visitors to this state will not face any problem with thinking of where to stay in Pahang. Its highlanders beckon tourists to enjoy the cool wind in a tropical country with an average temperature of 28C to 30C throughout the year. While the state offers its visitors with plenty of natural treasures, Pahang has it all to offer to the nature enthusiasts. Hotels and resorts in Pahang offer tourists with magnificent accommodations that would provide them a homey feel during their vacation in Pahang. Some resorts and hotels in Pahang offer all inclusive services, which cover accommodation, fine dining and transportation for their visitors. They also provide pick up service as soon as their guests arrive in Pahang Airport and send them back to the airport after their vacation in Pahang. There are a lot of luxurious hotels and resorts in Pahang, which feature personalized services and luxurious facilities at an affordable rate. With the diversified accommodation options in Pahang, visitors will not face any problem on where to stay in Pahang. The island in Pahang will never fail to fascinate its visitors. For diving lovers, resorts and chalets in Tioman Island would be a good option. 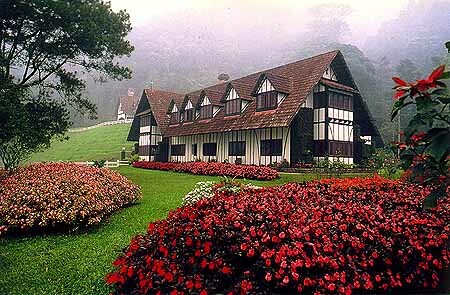 For visitors who wish to stay atop to enjoy the cooling and fresh air, hotels in Genting Highlands, Fraser’s Hill and Cameron Highlands are the best places to stay in Malaysia. In these highland areas, most of the hotels provide their guests comfortable accommodations along with scenic atmosphere ensure to make their stay in Malaysia unforgettable. Although there will be no problem on where to stay in Pahang but it can be quite a conundrum, as hotels in Pahang offer incredible amenities and unbelievable room rates. For visitors who prefer to stay in Kuantan for sightseeing, they can either choose to be pampered in a hotel or they could opt for a more affordable option, home stay or vacation rental. All these accommodations would offer tourists the opportunity to breathe and live in the loveliness of Pahang in Malaysia. The National Park (Taman Negara) has some all inclusive lodges and inns, which offer a stunning view of the park’s flora and fauna, eco-tourist should not missed to visit this park to see the beautiful nature creatures in this tropical rainforest. With all the incredible room rates, accommodations, and facilities from all the hotels in Pahang have to offer, thinking of where to stay in Pahang would be the beginning of a dream holiday in Malaysia.